This page has Cabinet decision highlights for National Parks in 1981. In March 1981, Cabinet approved the Cobourg Peninsula Aboriginal Land and Sanctuary Bill for introduction in the March Sittings of the Legislative Assembly. The Bill proposed the creation of the Cobourg Peninsula Sanctuary, with national park status. The Bill provided for a joint board of management for the area, the membership of which gave the traditional owners the ultimate say in the policy for the sanctuary. The Cabinet papers described the peninsula as supporting a rich and varied flora and fauna typical of the Top End of the Northern Territory in an area largely unaffected by European influences. The sanctuary’s large size, geographical isolation and state of preservation gave it unique value, along with the cultural and spiritual importance of the area to the Indigenous people who lived there. During the negotiations leading to the development of the Bill, the traditional owners agreed to the peninsula remaining as a wildlife sanctuary, with title to vest in a board of trustees consisting of traditional owners. The minister’s draft second reading speech noted that the traditional owners were enthusiastic about working with the Conservation Commission of the Northern Territory to protect the land and preserve it for future generations of Australians. Read the Cabinet decision - submission number 1365 and decision number 1596 of 2 March 1981 (5.7 mb). 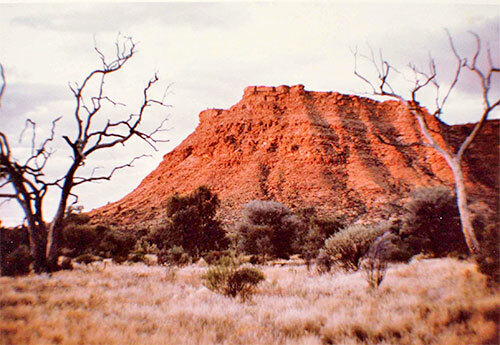 In October 1981, Cabinet considered a proposal to create a national park over the Kings Canyon area on the western portion of Tempe Downs pastoral lease. In 1980 the Chief Minister directed that Kings Canyon be acquired for a national park after extended negotiations with the pastoral lessee, Tempe Downs Pastoral Company, had proved unsuccessful. An offer to negotiate area and price was made by the Conservation Commission in June 1981, but the company failed to respond to this offer and the matter was brought back to Cabinet for further direction. The intention was to acquire 1,000 square kilometres of the 4,815 square kilometres of the Tempe Downs Pastoral Lease. The Cabinet submission advised that the area within the proposed park boundaries had not been grazed for the past 20 years and possibly not since the 1920s. The proposed boundaries of the park took into account the use of natural features to give control of watershed, feral animals and fire and minimised the needs for fencing. The boundaries were considered practical for management purposes and optimised the potential for tourist development and maintenance of conservation values. It was suggested that Kings Canyon would rank with Uluru in terms of visitor attraction and would form an important link in the tourist route between Alice Springs and Uluru. The area was considered botanically the most important in Central Australia, containing a richer array of plants than either Uluru or Finke Gorge. This included a large number of rare and relict plant species, as well as plant communities of interest to the pastoral industry. The fauna was also of considerable scientific interest, representing an overlap between the fauna of the southern sandy deserts and the central ranges. The habitat of the area was suitable for the reintroduction of rare and endangered species, complementing breeding programs for bilbies and western hare wallabies. The submission noted the area as a whole, and particularly the area north of Ochre Hill and in the Hope Valley, contained a considerable number of relics of Aboriginal occupation. Cabinet decided that steps should be initiated by the Northern Territory Government to compulsorily acquire the Kings Canyon National Park area. Read the Cabinet decision - submission number 1670 and decision number 1981 of 29 October 1981 (13.2 mb).